Valerie Cortez received her PhD in molecular and cell biology from the University of Washington last spring and did her thesis work on HIV vaccine design. She is currently researching zoonotic infectious diseases in Peru as a Fogarty Fellow. I began my Fogarty Fellowship a little over two months ago, and have spent as much time settling into my new apartment in Lima as I have trekking through the Madre de Dios region of the Peruvian Amazon. I recently returned from my first month-long field work trip to the jungle, and I admittedly found it hard to come back to the city. Although the work was physically demanding, especially in temperatures above 95F/35C, and there were things I lost on the trip—15 lbs, my reluctance to bathe in murky waters—as well as gained—lingering rashes, a plethora of persistent insect bites— I truly enjoyed every minute of it. I am currently working with my mentor, Dr. Daniel Bausch, and colleagues at the U.S. 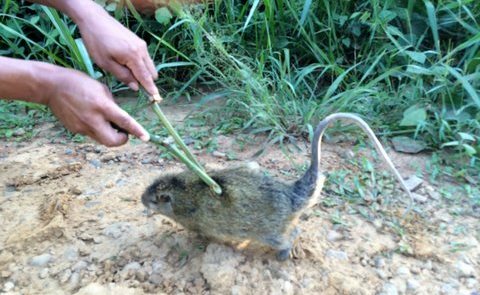 Naval Medical Research Unit-6 (NAMRU-6) on a five year project to survey rodent populations along the Trans-Oceanic Highway, which bisects a previously remote and undeveloped region of the Amazon. The effects of this highway and the subsequent changes in land use in the area have been dramatic, as the economic opportunities for farming and mining continue to increase. Indeed, I witnessed forest burnings on a daily basis, with the land being cleared for growing papaya, corn, watermelon and other crops. It is unclear how these changes may be impacting the wild rodent populations in the area, and in turn, the microbial communities they harbor, as domestic animals and humans now encroach on these previously undisturbed lands. The potential for zoonotic transmission of rodent-borne pathogens could be significant, and this highlights the need for surveillance in the region. To this end, NAMRU-6 has begun rodent sampling trips four times a year, with each trip directed by a rotating team of two veterinarians, one mammologist, eight field workers, and a few fellow bench scientists. We visit four different towns during each trip and in each town we spend four “trap nights,” setting up over 400 large and small traps across six grids in the areas surrounding the town, each chosen based on their level of land disturbance. Using a delicious concoction of peanut butter, oatmeal, and tuna, we bait the traps at dusk, and then collect them the following day at dawn. In between these times, we process the captured rodents in a makeshift “lab” that we set up and breakdown each day. Powered air-purifying respirators and other personal protective equipment are donned during this time to prevent any potential exposures while we obtain blood samples and biometric data before tattooing the footpads of the animals in order to track whether they are recaptured later in the study. Since my project specifically aims to survey the prevalence of Leptospira species in the environment and rodent communities, when I wasn’t tattooing animals, I collected water samples and inoculated cultures in the field to hopefully obtain isolates of the bacteria, as new species are still being identified. Overall, I feel like this was an absolutely amazing introduction to field work and I am incredibly fortunate to have had the opportunity to learn about so many new plant and animal species. But I really have my colleagues to thank for having such a fun, productive, and perhaps most importantly, safe field work experience. While I’m excited about the next phase of fellowship setting up assays in the lab, I cannot wait for my next field work trip in January!